GrandMA Studios presents another adventure through many beautiful worlds in their popular Reflections of Life series! 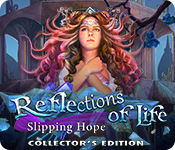 Reflections of Life: Slipping Hope Collector's Edition is rated 4.3 out of 5 by 20. Rated 5 out of 5 by fiewi1 from What a fairytale with attention to detail Well, to be honest I have already forgotten what the story was about, but the feeling it left me with is much more precious. Mesmerizing graphics, attention to detail, exploration through scenes, rooms and riddles that welcome you into a world of fairytale and true gaming fun! My new favorite. overall rating: 4,9! Rated 5 out of 5 by mafu1178 from Excellent Challenge Storyline and variety of puzzles made this game enjoyable. One of the best I've played yet. Rated 5 out of 5 by Majestyx12 from Blue Rose Beauty The hops are lovely to look at. Some are used more than once. Sparkling owl means there is a morph in the hops. Most have a morph in them. Most hops are interactive and are nice but I would have liked a list more. I liked collecting the spying bats as they would spark to flight when you found them. If you find all of them you open a hidden puzzle in the end. You can find the ones you missed. It has a indicator on the side as to how many and if you found them all. The different colored coins found in the zoom areas can be exchanged for magical creatures once you have enough coins. They have legend info for that creature and you have to use the color it wants for every one. The story is sad as to what needs to be done. I wouldn't wish it on my worst enemy. I did like going to different Guardian worlds. The ship and captain was my favorite world. Replays on 16 hops, 14 mini-games, 19 movies, 8 music, 14 wallpapers and 10 concept art. Rated 5 out of 5 by GoneFishin86 from I Bought The Rest Of The Series!! I had tried to play another of this series a year ago and for some reason it struck me wrong. I gave this game a chance though and LOVED IT! It completely renewed my interest in the whole series. The mini games are simple but fun and the graphics are just gorgeous. I am one of those people guilty of liking games when the story is already familiar like the Dark Parables series but this game was very creative story wise and kept my interest. Rated 5 out of 5 by heartblob from reflections of life ...deep in thought excellent game.. excellent graphics, plenty to do in this game and the puzzles although some [ new to me ] are interesting and relatively easy, hos are easy , but even so..it is a very good and entertaining game , find those pesky bats sometimes more than one in each scene . 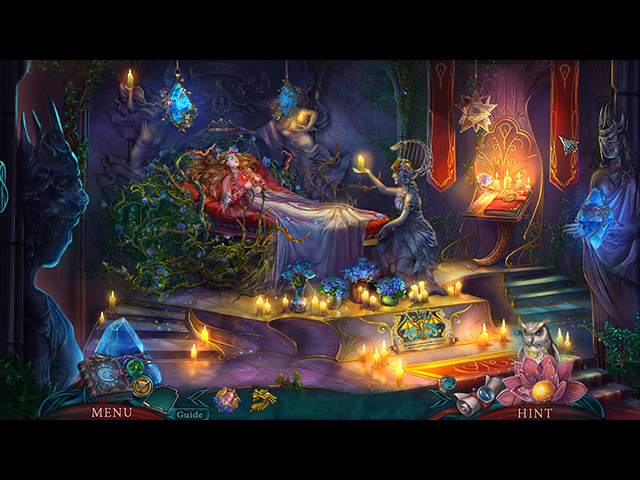 Rated 5 out of 5 by LosAngeHell from Reflections of Fun A good game, beautifully crafted. I bought it before finishing the demo. Rated 5 out of 5 by Kikime from Exquisite Fantasy Beautiful Immersive Game Reflections of Life is always a beautiful game filled with every color, clear and lovely realistic picture that make compelling and original fantasies come to life for me. 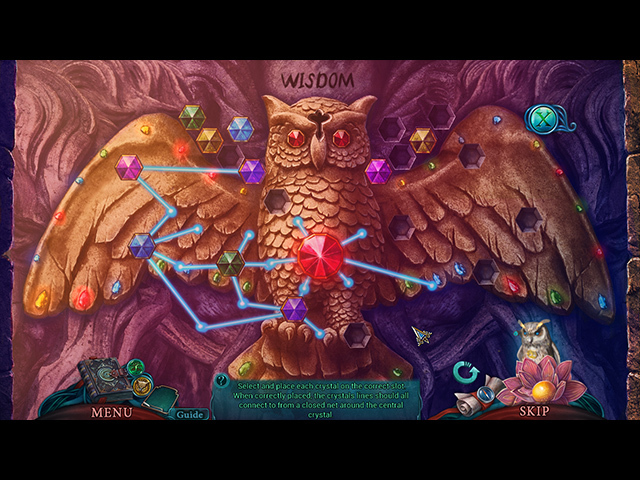 Slipping Hope is another of these very well crafted games in bright radiant colours and a high level of detail in everything. The story is well told and well written. The voices are clear, melodic, and easy to listen to. The characters made sense. The hops are perfect, with well defined objects that are neither overly easy to find, nor so difficult I lose my sense of fun and want to give up. The sheer beauty of the design makes up for the more well hidden objects being harder to find. I did find most objects really quickly, so far as I've played. This is the way I like my hops, so that they flow with the rest of the game, with just a hint of challenge. I am completely in love with the in-hop morphing objects. These are exactly perfect. I like to leave them flickering while I search for other objects. The puzzles have been some of my favourite kinds, very creatively made. I enjoy the twisting and turning, and especially resizing objects. I love a high variety of challenging mini-games and intricate puzzles with clear designs, like the ones I have found in the demo. I am also fond of handheld lenses and enjoyed that first book search. The hidden bats are hard for me to find but not impossible and very clear once I know what I am looking at. What is more, there is in extras a page of empty, and then not, little bat silhouettes from which bats can be sought throughout the game by locating unfound bats and jumping you back. I barely noticed the coins but they are written on. I really quite like the "statuettes" that you can buy with them. I like the owl. It is not silly looking or ugly and it doesn't talk or demand my attention. It just flies up to high things and takes them down. It adds to the visual experience without exacting energy. Plus, I loved wearing the brightly painted leather glove he perched on. The wallpapers were better than ordinary, very beautiful, unusual pictures, and a great variety of types of pictures for differing tastes. I like the one filled with stairs the best, and the icons and the mythical beasts. And I don't ordinarily like character portraits, but I like these, they are so well drawn, and creative and painted. I always like a cat. I will definitely purchase the collectors edition of this game. Rated 5 out of 5 by bmn5772 from ONE FOR THE ROAD 2018 Thanks for the awesome game to end the year with.............the graphics, HOS, and music are amazing..........Happy New Year!